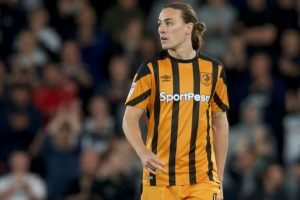 Australian international midfielder Irvine joined the Tigers in August 2017 for a reported two million pounds fee, having scored for Burton Albion (and then been red carded) against the Tigers 4 weeks earlier. After trying out in a few positions he showed his finest form in the second half of the season as a tireless attacking midfielder supporting the striker and contributing occasional goals. After an exciting summer in Russia representing his country in the World Cup Finals, Irvine returned to City late and eased his way back into the first team in the early stages of the 2018/19 season via the bench. Born and raised in Melbourne, Australia, Irvine spent time on the books at Melbourne Victory before moving to Scotland at the age of 17 signing for Glasgow Celtic. He made his only SPL appearance for Celtic in 2012, and spent subsequent seasons on loan at Kilmarnock and Ross County where he established his first team chops. In July 2015 he made a permanent switch to Ross County, and a year later he headed south signing for upwardly mobile Burton Albion. At Burton he quickly made his name as a goalscoring attacking midfielder. Thanks to his Scottish-born father, Irvine was awarded under-19 caps for the Scotland international side in 2011. A year later he had switched allegiance to Australia, his country of birth, for whom he made his senior debut in October 2013 against Canada. Jackson is now an established part of Australia’s senior international setup.